Q: How does time change your style? A: I’m not sure if this has to do with style, but I’m an art teacher, and I often recommend to my students that if they’re working on a project and they’re not sure what should happen next, I tell them to walk away. To give it time. When you come back, maybe a week or so later, your work looks and feels totally different. Sometimes you can immediately see what problems need to be fixed, or you can look at it and suddenly feel like it is amazing. It’s a piece of advice I feel like applies to most art forms. With visual art I find that it works really well. Time away can give you a new perspective on the work that is much needed. Mind you, there’s also the possibility that when you do step away that you come back and realize that you don’t like any of it. That also happens. [Laughing]. It’s difficult because when you are working on a piece you become incredibly attached to it. You are right on top of it, and you can get stuck on different sections – trying to decide right away what to change and what to keep. I know I can become very attached, and there are parts that I want to keep no matter what. Yet, when you step away you realize that you can live without those parts you were stuck on. It really is sad when you have to scrap the project or change it drastically, but distance does make that easier. Q: What’s a signature in your work that is constant? A: One signature that isn’t there is my actual signature. A couple of years ago I stopped signing my work because I don’t like having my name on the front. I feel like it really interrupts the picture, so I don’t do that anymore. I do a lot of work in a lot of different mediums, so my work looks pretty different. My ink work is probably the most similar. Something in every piece that I really want to be there is the way the negative space is used. I love the way negative space looks, so I often put a lot of focus on it. It’s funny because in school I’m supposed to analyze everything, and I don’t always have a reason for why I make art the way I do. It’s hard to talk about drawings – illustrations in particular. The picture itself tells the story, so to analyze and interpret that textually is going to be quite a challenge for me. It’s using language to describe something that is already described in the picture. Q: Who once got you in trouble? A: I’m trying to think about life trouble versus art trouble. I feel like my life has been really peaceful lately. You get to this spot where you’re in your thirties, you move to Mid-City, and you don’t necessarily climb water towers and get poison ivy anymore. Wait, that sounds like a story of trouble. Well, it was the middle of the night, and there was a super rickety water tower. Climbing it wasn’t probably a great idea, but we did it anyway. I woke up covered in poison ivy, and I was incredibly allergic, so I had to go to the doctor and get all of this medicine. It was worth it, though. I was with a friend during that time, but I don’t think it was him that got me in trouble. I am pretty sure that it was my idea to climb the water tower, so I can’t really blame him. I guess I’m the one who gets people into trouble. [Laughing]. Although, my dog is often causing situations that result in trouble. I love taking him on the trails in City Park. Usually he is great, and sometimes he gets a wild hair and won’t come when I call. He’s a sweet dog, but he looks really tough. I don’t want him to get over friendly with a stranger, but he loves people so much, so there’s always that situation. Q: What is something you feel like you’ve stopped waiting for? A: I’ve stopped waiting for…this might sound weird…I’ve stopped waiting to be discovered. There are a lot of art narratives that have to do with a famous art person coming in, seeing your show, and then you never have to worry again. Then you get to draw what you want for the rest of your life. It’s something that I’ve thought about and thought might happen someday. I don’t think about my work in terms of waiting for someone to discover it anymore. Instead, I think about my work as making things that I like. I probably got to this point over time because I never was discovered. [Laughing]. Waiting on something that almost never happens no longer felt like a useful thing to focus on, after a while. Harriet Burbeck’s illustrations, watercolors, and inks can be found on her website, and you can also follow her on Instagram to see her latest works. 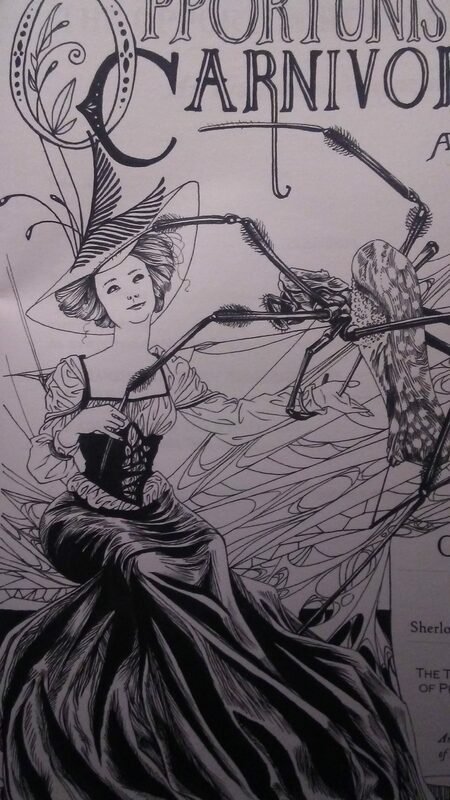 Her exhibition, “An Illustrated History of Domestic Arthropods,” is opening on October 13 from 6:00 until 9:00 PM at Barrister’s Gallery (2331 St. Claude Avenue). “An Illustrated History of Domestic Arthropods,” is a series of illustrations from a book she made of that same name, and a small installation with artifacts from the imaginary world in which the book is set. The project is about a world in which humans are the only mammals and the rest of the animal kingdom is comprised of huge insects and other invertebrates.